I always used to be afraid of putting oil on my skin. As someone who's suffered from acne for around a decade, I've tried a lot of stuff to get rid of it. And I learned that oil-based serums are actually wonderful for all types of skin ailments, including acne. The best part is: it's really easy to create your own custom DIY face serum. Oils protect our skin. It's important to keep it clean, of course, but don't feel like you need to scrub your face till it's tight and keep it as dry as possible to avoid breakouts. In fact, that really does much more harm than good. Face oils & serums are a wonderful way to cleanse, heal, moisturize and protect your skin. All you need to make your own DIY face serum is a carrier oil (or oils!) and essential oils (or oil!) of your choice. I've written about the properties of different carrier oils before as well as a few essential oils, but I'll summarize a bit! There are so many others, but these are the ones I love best. You can experiment with blending more than one oil if you think your skin would like it – mine, for instance, gets pretty glowy when I use a combo of sesame and jojoba. JUST SO YOU KNOW, carrier oils can be really helpful just on their own. Don't be afraid to skip the essential oils if you want to keep it simple! But I like to play around and mix em up, so here are my favorite skin-saving essential oils. It's important to remember that you don't need to use much of these at all. Tea Tree Oil: Use it for acne. It can be kind of harsh, so go easy – I suggest 5 drops max per 1 ounce of your carrier oil(s). I'm always amazed at how WICKED FAST it clears up my skin. Eucalyptus essential oil is good for acne, too and it's quite a bit gentler than tea tree oil. Ylang Ylang: Ylang ylang essential oil is soooo soothing. If you have irritated skin from breakouts or sun damage, try ylang ylang. I have yet to overdo it with ylang ylang, but 5 drops in 1 oz is a good place to start. Rosemary: Rosemary essential oil is an all-around great oil for skin and hair, so it's another good one to start with if you're not sure, or if you're making the face oil for someone else and aren't quite sure what their needs are. It has antibacterial and anti-inflammatory properties so it's good for fighting acne. It's also beneficial for healing blemishes, improving skin tone and antiaging. Lavender: Lavender essential oil is good for fighting acne and also for healing scars. Carrot Seed: Amazing for people with eczema and aging skin. This is not a comprehensive list by any means but Aroma Web has what looks like a list of every essential oil made if you want to scope some more out. I can help, too! Leave a comment below & I will be happy to answer any questions. This list is simply of a few of my favorites that cover a range of skin types. Put your oils in a bottle and shake it gently for 30 seconds or so – you're good to go! It's really that easy. Any bottle that seals tightly is good. Store your serum out of light to prolong nutrient content. Amber or blue glass bottles are especially good for keeping light out and keeping your serum fresh longer. That's really all there is to it! Apply a small amount to damp skin each time you wash your face. INCREDIBLY useful information, Kylie! Thanks a bunch for sharing! I never realized carrier oils have useful properties too! That’s really cool. I’ve also never heard of rosemary essential oil but I think now I need to have some. Rosemary is my favorite herb, it smells so amazing! Thanks for popping over and commenting on my super easy pineapple slicing method…! am so glad I figured that out before – happy to have helped!! Great information! I love tea tree oil and lavender oil! Amazing! 🙂 Thanks for sharing! Hi Kylie! I saw this link on Pinterest and I bought Avocado oil and Carrot Seed for my essential oil. I was curious how many drops you’d put in of the carrot seed per one ounce of the avocado oil? Thanks! Awesome! I would do 5 drops per ounce of carrier oil to start. Good luck! Let us know how it goes! wich oil you recommend to eliminate expression lines around the eyes ? Thanks for all the info! I am looking to change up my face regimen and ran across your site! What blend do you recommend for acne? I also have oily skin, so I don’t want something that will leave my face feeling even oilier. Thanks! Thank-you so much for this information. 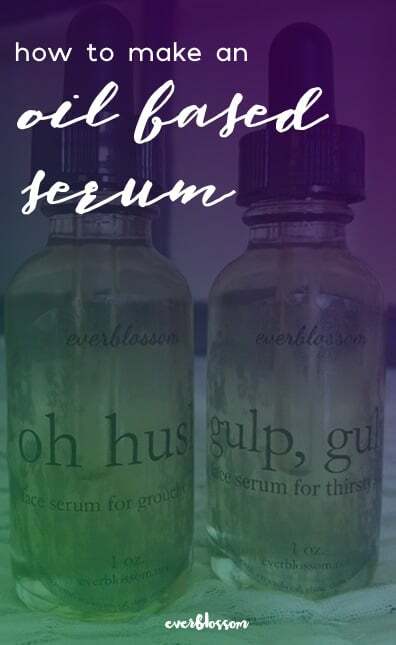 I’ve made my own serum with jojoba, grapeseed, and eucalyptus. So far, it is great! How often do you use face serum? What is your daily skin care routine? (e.g. do you use/how often do you use moisturizer, soap, serum?) I don’t want to over-do it. Also, do you have any suggestions for natural sunscreen? I have acne prone, oily skin and all suncreens aggravate it. Thanks again! I use it morning and night! Sometimes midday as well, especially in the winter when the air is really dry. Wow! I really want to try the jojoba oil and the tea tree oil if that is a combination that can be used. I have seen the sesame oil and some fragrance used before. I recommend trying 1 drop of rose oil, to 2 drops of sandalwood oil, 2 drops of Frankincense oil (used by Kings) and 1 oz of avocado oil. I found the recipe on: homemademommy.net. I was wondering if you could explain the benefits of using coconut (fractionated) oil and EV olive oil as bases? I’m not asking about mixing them together, just each one. In the comments of your tea tree acne post, you mention that the olive oil could be used for a serum. I also already have the coconut oil on hand for uses with EO’s. Looking forward to your reply, thank you! It might be too much ~ just go by how your skin feels. The oil should soak into your skin, not sit on top of it. This is all amazing info, so thank you so much! I have a question about applying the serum: after applying to a damp face do you wash the oil off? And how many drops did you apply? Thank you! so to make the serum, you mix the essential oils with the carrier oils? I recently started a new birth control and I think with the hormone change it is causing me to break out, I have 2 spots which are I believe cystic acne and they hurt! My skin is super sensitive and the slightest things seem to make me break out. What would you recommend? I currently use cliniques 3 step stystem and makeup but I’m not sure if the toner is making my face worse. Any and all advice is very much appreciated! Eeek! Hormones can throw everything off. I think as your body adjusts, your skin will too. In the meantime use super-gentle oils on your skin, since it’s irritated. I would be using jojoba oil and lavender in your situation. 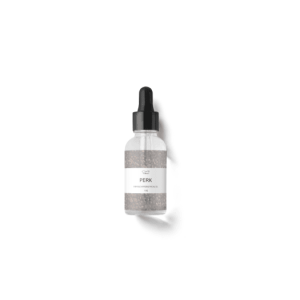 Kate “Oh Hush” is the serum you’d want to use from the Etsy shop. And “LULL” for a toner. 🙂 Both are super gentle. When mixing the two oils do you do equal amounts of each? I went and bought tea tree oi today after reading the post about using it for acne and then I checked out this post about making the serum and I definitely want to try it! I have been trying to find a way to get my acne under control for ages and hate paying the high prices for acne treatments lol time to try making my own! thanks so much, I’ve had great success using the OCM. Do you have any tips for making such cute labels that aren’t ruined by the oil/water? Thanks! Right Angie! You use a small amount that blends into your face. Hello! I love you post and will like to give it a try. I have acne and very oily skin. I purchased jojoba oil, sesame seed, lavender and TTO to make the serum! How should I mix them? Thanks!! Yharis, I’m so glad you are going to give oil-based skincare a try! I would start with 1/2 ounce each of jojoba and sesame, and 6 drops each of lavender and tea tree. That will give you a wonderful acne-fighting serum. Wow!! I’m so glad I found your site!!! for I have been looking for simple understandable explanations and instructions! I’m glad to say I finally found you!!! YAY!!! Thank you for such fabulous information! and your blog is GORGEOUS. As a brand-new blogger, I’m completely inspired to keep working in hopes to be as wonderful as Everblossom someday! Thank you again – keep on rocking!!!! I just stumbled upon this post via pinterest. I just started making my own facial serums and was thinking about doing a blog post about them as well. Thanks for lots of inspo! Also your blog is absolutely gorgeous. I love that you have an integrated shopping cart as well! I love Tamanu Oil. Have you used that oil at all? You don’t mention it all. Hey, thanks for all the great info. I am going to try this ASAP. I have a few questions: I started using aple cider vinegar as a toner and I don’t know if I should use it before or after or at all with the serum? If I use it after, you said your face needs to be damp to apply the serum, so if it’s damp from the toner is that okay?.. Hi! Thank you so much for this wonderful article. Recently I am in a country where sun is always out whole year. Now my face have blemishes due to over exposure of sun. My skin is neither too dry nor too oily, though the weather is very humid. I am thirty plus and wish have glowy and young skin. I would really appreciate if you could suggest any serum or essential oil. Will it be fine if I apply oil on my face during the time I am exposed to the sun. So sorry for the trouble. Thank you so much. Hi, many thanks for all the wonderful and useful information. It has been lovely reading and trying to understand how and when to use essential oils. I wonder if I can ask for advice and information please. I am 59 and have psoriasis my skin is sensitive and prone to flare ups, but when a I found you via Pinterest your appeared so knowledgable and passionate that I continued reading right to the end! I really want to try the face serum and would like to use it at night so it can soak into my skin throughout the night. Would jojoba oil, lavender, frankincense and myrrh be okto use together as a face serum. Thank you so much for taking the time and trouble to pass on your information. i have acne scars, can you suggest a specific oil with the tea tree oil ??? Check out CLEANSE serum in the shop here! It’s jojoba, sweet almond, tea tree, and lavender. I always hated when a young person tries to sell me something for my skin — not having been there etc but…. I was always foregoing the moisturizing part of my daily routine because I thought that my oil was enough — and when I would be told to wear moisturizer,I would find that I was right — I was so oily that my makeup would not last half the day BUT… I just started to use organic moisturizer and serum and am very pleased with them. It had sounded counterproductive but with time I saw a change in my old skin so…. I’m almost 50, and would to know what combination of oils would be the best for wrinkles, aging, etc. I would really like to avoid getting any more Botox and go natural. I have combination skin. Thank you so much for your articles on treating acne. If I wanted to use multiple essential oils in a carrier oil, do you have to increase the amount of carrier? Example: If you were to use Rosemary & Tea Tree, would you put 5 drops of each to 1 oz carrier? or 2 oz carrier?